Peripheral maker Genius has revealed the DeathTaker, a new mouse aimed at MMO and RTS gamers. It's the company's first mouse targeted at gamers, the device offers nine buttons, built-in macro memory, a backlight with 16 million possible colors, adjustable X and Y axes, and weight management. Pricing in the US is $79.80, which seems kinda expensive for a newcomer. The DeathTaker features an aggressive and sharply-detailed design with the all-important backlight, customisable through an entire 16 million colour palette. Bundled software, the Scorpion UI, allows gamers to customise five profiles with up to 55 macros for storage into the device's in-built memory. As well as allowing easy transfer to a different PC, Genius claims the in-built memory and CPU in the mouse prevents the macros being detected and blocked by games. Those macros make use of the nine buttons spread out across the device's surface, each rated to a claimed 8 million clicks. Wired with a 1.8 metre braided cable for reliability, the mouse even includes a gold-plated USB connection for the difference that's likely to make. Genius has also included what it claims is an 'in-built over-clocking SCGii engine,' which allows the sensitivity across the X and Y axes to be independently adjusted from 100dpi to 5,700dpi. 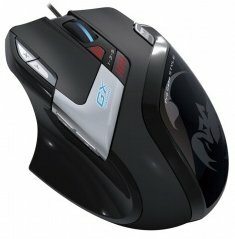 The heft of the mouse is also adjustable, with six 4.5g metal weights included in the package.